Securitization as a concept can be dated back to the mid 19th century, when farm railroad mortgage bonds existed in US. The idea is to pool a set of cash flows and sell it as a block to investors, who may be happy with the risk of all of them put together, but not have exposure to only one. Consider a small bank XYZ has a Rs 1500 Cr housing loan book. Now the bank wants raise Rs 200 Cr by monetizing its existing assets. The XYZ bank will pool together 200 Cr worth of loans which might includes thousands of loans. Then based on the future cash flow to be generated and the quality of pool account, an independent rating agency gives a credit rating. Likelihood of default and other factors play a role here. Assume the actual returns on the total loan book is 12% over a period of next three years, because of the risk factor involved, the pool product is sold at 9.5%. Margin 2.5% goes to the XYZ bank as maintenance charges, as they will be responsible for collecting the cash flow and disbursing to the investors. Certificates are created worth Rs 200 Cr and are open for investment, and the book is sold for Rs. 200 cr. XYZ bank generates Rs 200 Cr, once fully subscribed and will be collecting the cash flows from the borrower and distributing to investors on a periodic basis for next three years. The above example is the simplest form of securitization, the actual working process is a bit more complex. Where in their will be clauses in case some part of the pool account goes bad, payment structure etc. Pass Through Certificates are like bonds, but the difference being (PTCs) are backed by assets or mortgages and the periodic payment also includes the principal. In the above instance the 200 Cr pool can be issued certificates of face value Rs 1,00,000 in 20,000 quantity. Every PTC holder will be paid periodic interest payments along with a part of principal. The PTCs are more standardised and can be traded in secondary markets. For PTCs special purpose vehicle (a trust) is created which is settles the payments and is independently managed by a trustee. Direct assignment is more of a buying a loan book at a fixed interest rate. For the same case above, another big bank which wants to have a exposure to housing loan will go and directly buy the pool. Here the terms and conditions are more of negotiable in nature and can be customized according to the needs of both the parties. Recent times have seen more of direct assignments rather than PTCs. Banks have stepped up their game and are going for customised products under direct assignments, where in the can select the type of pool account they want and the risk pattern they are willing to take. Why Would Banks Be Buyers? Banks need to lend to the “priority” sector (infra, low cost housing, etc.) and may not necessarily want to set up the front end, called the origination structure. NBFCs have origination, and they would like to sell their loans to the banks so that they can get money to lend more. Banks then buy out the loans from the NBFCs, which securitize them. Now, a Direct Assignment is simply transferring the entire risk to one buyer. A Securitized PTC kind of product allows multiple buyers to participate in a single pool, and provides for a lower risk (originator can take the initial risk). In this structure, investors are paid from the pool receivables, but the extra cash flow will be set aside for any future shortfalls in cash flows or defaults. In the above example, the pool has a yield of 12%, but it might be sold to investors at 9.5%. The rest 2.5% will be set aside every month, which will offer the necessary buffer in case of future shortfalls in cash flow. If there is no disturbance in the cash flows, then the 2.5% will be entitled to the originator. The 2.5% is known as Excess Interest Spread (EIS). In Par structure the responsibility will be higher on the originator in terms of maintaining the loan and seeing to that it does not turn to default. Typically an originator will take a 5% risk – saying that listen, upto five percent defaults, I’ll take. Since the excess interest spread in the example was 2.5% per year, the originator’s risk is covered in two years. If the pool sees even higher defaults, then the risk gets passed on to investors. For that protection, they get a lower yield with their PTCs than the pool gets as a whole. In premium structure the investors will have the same PTC yield as of pool yield. But will be paying higher value for certificates at the beginning itself. In the above instance, 200 Cr is at pool yield of 12% for a period of three years. So the investors will be subscribing for Rs 212 Cr issue which are backed by assets of Rs 200 Cr. The yield of 12% will also be the on Rs 200 Crs. The extra 12 Cr goes to the originator (which is the present value of future cash flows the originator will be earning in terms of 2.5%). Here the risk of investors is higher as the originator has washed his hands of the loan book, and is only responsible to maintaining the loan account rather than taking measures not turn into default. Here NBFCs dont have much skin in the game. Coming to context in India, securitization has been a more recent development and has been still evolving in India. The securitization in India can be dated back to early 90’s. The first securitization deal took place in 1991 when Citibank raised Rs.16 crore from GIC Mutual Fund by selling some of its auto loans via securitization. In 2002, SARFAESI Act, provided the much-needed trigger for the banks to sell their non-performing assets to asset reconstruction companies. But at this juncture where NPA has been a bigger problem for the banking sector than ever before, the banks are net buyers of securitised products rather than being the major sellers in direct assignments. 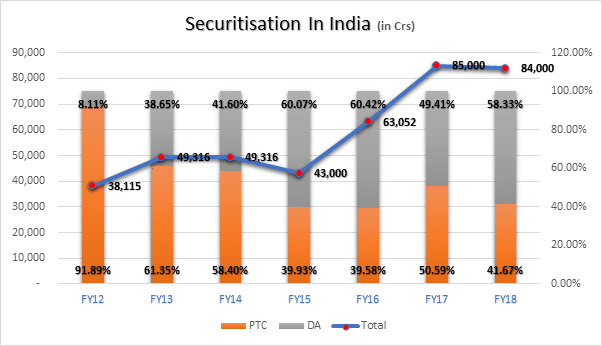 Recently securitization in India has become limited to the banks and has not found any major interest from investing community (apart from limited asset reconstruction firms). NBFCs have been generating the securitised product and banks have been actively buying in. The total market of securitised products in India at the end of FY18 was at Rs 84,000 Crs. 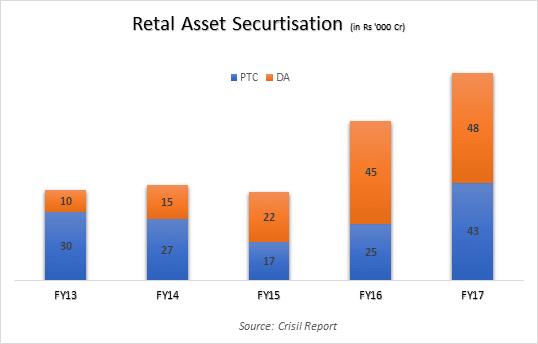 Since the beginning of FY16, the market of securitised product has doubled. The only hiccup was in FY18, where the growth was stunted. Post the implementation of GST, their was ambiguity in the applicability of GST on transfer of receivables in securitisation transactions. Due to ambiguity most of large originators were reluctant to form new securitised products. Early this year GST council in its FAQ session clarified that receivables transfer in securitisation will not be part of GST. This has again put the securitisation market in growth trajectory. If you see the increasing trend of DA in the securitisation market its quite alarming. From 8.11% in FY12, it has come a long way to 58.33% in FY18. The major reason for that being banks are proactively negotiating the terms and conditions with the originator and buying out the pool rather than buying a standard PTC. From the time RBI came heavily on non-performing assets (since 2015), banks have been actively taking hit quarter on quarter. Since 2016, PSBs which account for 70% of banking sector assets have accumulated nearly 88% of the NPAs of the banking sector. Banks have been increasingly trying to reduce their NPA and provision off to the maximum extent. Along with this they are being asked to meet the priority sector lending targets. Banks have found a solution to the part of this problem via securitisation. Securitization has become major tool for banks to meet their priority sector lending rather than instrument to sell off their non-performing assets. In India ARC market is very much under developed with only select few players. 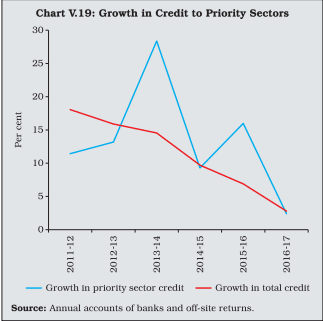 What Happens with Priority Sector Lending? According to RBI guidelines, every bank needs to have 40% of their loans (adjusted net bank credit, ANBC) given to a priority sectors. Priority sector lending primarily aims at inclusive growth of the economy rather than just disbursing loans to a certain set of sectors.Priority sector lending includes agriculture loans, housing loans, MSME loans, education loans, export credits etc. Agriculture loans form a major chunk with 18% target followed by MSME at 7.5%. While the overall growth in advances is falling due to higher NPAs, the growth in priority sector lending is increasing. Major loan defaults have been happening in big corporate loans (which don’t majorly don’t qualify under priority sector loans), which are being written off or provisioned on a periodic basis. Whereas the retail loans have seen a lower default and has thus pushing up the priority sector loan percentage. According to the RBI report for financial year ending 2017.For public sector banks, the loan amount outstanding under priority sector advances to MSMEs stood at ₹3.15 lakh crore — 6.3 per cent of ANBC against the target of 7.5 per cent. The major problem area for the banks in meeting the PSL targets is the outreach. Most of the banks don’t have outreach to tier III cities and rural areas. Banks of the size of SBI have managed to reach rural areas to some extent. Others have considerably failed in the outreach. NBFCs on the other hand thrive in Tier III cities and rural areas. This makes it easier for banks to achieve their priority sector lending through NBFCs or MFIs. For the banks which don’t meet the PSL targets they need to buy out some loans from these NBFCs or find other alternatives which meet these criteria. For instance other alternative includes parking the money with NABARD at a 6.5% interest. Which in most cases doesn’t help banks (6.5% is the cost of the capital at repo) and the bank can earn a better return by buying securitised product from NBFCs. Securitization has been mostly a win-win situation for both the originator and investor, but it always comes with some risks. Meeting PSL targets: The banks can meet their priority sector lending targets easily without having to take the headache of maintaining a loan account. Sharing of Risk: Under the direct assignment banks can ask the originator to take a certain cut, if some loan accounts in the pool go bad. For instance, he banks can create a agreement stating, the first five percent bad loans will be borne by the originator. Post that the next 5% will be taken by the insurance companies and the rest 90% will be taken by the banks. This makes banks job much easier and less risky. 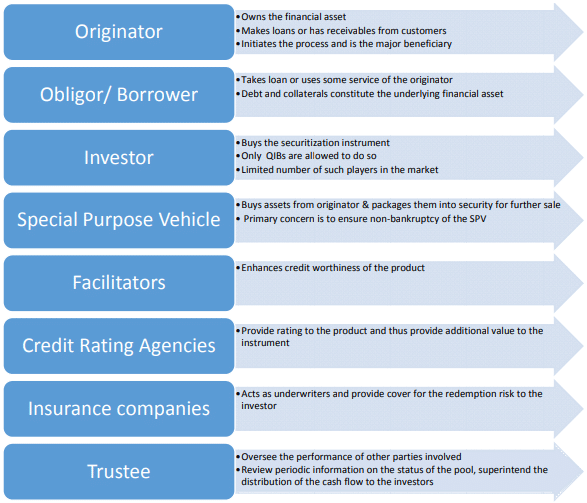 Increases the return on equity ratios for Originator: For the originators securitizing the products will generate the extra returns for the same investment. In the above example, the originator will be earning an extra 2.5% return on the same investment post securitization. Apart from that, originators will be charging loan opening fees from clients, which adds to the income. Greater Outreach with Lower Cost: For the banks getting into direct assignment, its as good as the banks themselves giving the loan. They will be getting returns, and they can have exposure to a base which earlier they couldn’t achieve. They need not open a bank in rural places, but still they can get rural exposure with the help of securitisation via MFIs. Changed in Interest are not passed through: As the securitization is a complex process and any intermediate change in interest rates might not result in change in the yields of the securitised products. Mainly because the originator banks don’t change their interest rates in accordance to changing rates of RBI. So if a bank cuts rates, the NBFC is not forced to – so the pool yield doesn’t reduce, and banks earn the same interest even though their lending rates have fallen. This results in lower transmission of interest rates to borrowers, and RBI will find that unhealthy. Banks Will not be Doing the Necessary Due Diligence: The originators will be taking the first 5-10% hit in case of defaults, this gives the bank much of a buffer. They need not actively involve in checking the loan origination process and protocols used by the originators. For instance, the loans which are generated doesn’t have sufficient collateral to back it up (may be the originators valuation of collateral might be different). This gives rise to systemic risk. How Does Risk Get Shared? Securitisation was a easy way out for cash starved finance firms to sell their illiquid assets and generate cash. During the process, the risk of defaults in the loans were getting transferred to the buyer. So RBI guideline stated that the originator also should have some risk associated even after the securitisation process, this is known as Minimum Retention Requirement (MRR). This essentially means if a part of the loan pool goes into default, then the first hit will be taken up by originator. So for loans with maturity of 24 months or less MRR requirement is at 5% and for greater than 2 years it’s 10%. In most cases the actual MRR given out by the originator is 3-4% excess than the requirement to make it attractive. There are typically three tiers of insulations for investors in case of defaults. The first one is Excess interest spread, followed by first loss facility and then second loss facility. Its not as straight forward as we think. Consider an example, Pool principal is Rs 103 Cr (yield of 18%), the actual sale value of pool loan is at Rs 100 Cr (yield of 10%) and EIS of 10%, first loss facility of 6% (part of cash collateral which are parked in liquid funds or FDs) and second loss facility of 5%. The term maturity is for five years. We will first understand what they are and then go about the workings. First Loss Facility: First loss facility is the first set of losses which are borne by the originators. Typically it varies in the range of 5-10%. In the above case 3% of the first loss is in the way of over collateralization (have given 103 Crs loan book for sale consideration of 100 Crs) and another 3 Crs might be parked as cash collateral (may be FDs or liquid funds). The first loss kicks in, when the defaults exceed the excess interest spread. Second Loss Facility: Second Loss facility is undertaken by a guarantor. The loan originator pays a certain fees to the guarantor (it might be a insurance firm, trust, bank or originator themselves) stating if defaults are greater than certain amount (16% in the above case), then he will compensate for next 5-10%. Second loss facility kicks in post the exhaustion of EIS and first loss facility. The returns of the above example will be as below, considering there are no defaults. Note: The Loan repayments starts from Jan 2018a nd the tranche has been sold in Dec 2017. To make it easier for understanding, the payments are assumed to be equal monthly instalments. Case 1: First year there is no defaults and second year 4 Crs goes bad. Case 2. First Year there is no defaults second year 10 Crs goes bad. Again for first year, originator would have booked 5.89 Cr as profits. At the end of second year 10 Crs goes bad. The first 5.89 Crs will be ploughed back from EIS, then first loss will be triggered. Next 3 Crs will be compensated via reducing the principal of the pool account. (As 3 Cr was over collateralisation which was done in the beginning). And another 1.11 Cr is compensated from the fixed deposit. They will be still left with 1.89 Cr in FD. Case 3. First Year there is no Defaults, Second Year 14 Cr goes into default. In this case, the first 5.89 Cr will be put in from EIS, next 6 Crs from first loss. After this the second loss is triggered another 2.11 Cr will be put in by the guarantor. Typically the guarantor charges a small premium for providing insurance for 5 Crs, post EIS and First loss has taken a hit. Any more defaults above 16.89 Crs (5.89 + 6 + 5) will be taken by the investors. The originators have invested 6 Cr ( 3 Cr over Collateralization and 3 Cr Fixed Deposit). If they maintain a zero NPAs, every year they will be earning 6 Crs on an investment of 6 Crs. The return is awesome, 100% on capital at risk. If the originator maintains the pool account without NPA for two years, than any amount of losses going further will not erode off his initial investment. Why is it a Win – Win Situation For Both? For NBFC, it is a easy way to cash in the illiquid assets. And typically for NBFC NPA rate is below 2-3% in most of the cases. Of course there are exceptions like Sriram Transport Finance were NPA are at 8%. If they maintain the same NPA pattern for the securitised product as well, they will be earning a huge chunk for little investment. The only problem being there is mass defaults (the US case were mass defaults in housing loans took place during 2008 financial crisis). Also for the NBFCs the returns are over and above the loan origination fee they charge for each loans. For the banks they are getting a decent return of 10%, without incurring much of expense (apart from cost of funding), and they are protected for 11% of defaults from the day zero (in the above case) and if the first year goes through , the NPA buffer keeps on increasing. This relieves a bank much of headache in terms of maintenance and recovery of the loans. And also provides scope for inorganic growth and necessary diversification. In a way the loan originator and buying investors (banks) are very content with the deal. RBI has not been very happy with working of NBFCs and Banks in part of the securitization process. In its recent statement last month, RBI wanted to have better efficiency of securitised products. The end borrowers need to be having advantage of low cost of funds from banks and lower cost of operations and greater reach of NBFCs. Below are the few of changes which RBI is trying to bring it in. The NBFCs which have been majorly the originators of securitised products were the ones actively involved in processing a loan and were the ones to assess risk attached with the borrower. Banks didn’t have much of the burden of risk assessment on their shoulders. Going forward, that will change. RBI has said that banks also need to be co-originators of loan. Essentially, banks will be part of loan disbursement process. Banks that co-originate will be scrutinising each and every loan application which are verified by the NBFC. Technically it is as good as bank giving a loan and post disbursement serviced by a NBFC. The reason behind doing this is, RBI wants banks to know, the kind of loans they are willing to take (rather than taking what NBFCs give) and resources (like credit scores of individuals) available to banks can be used efficiently. While banks and NBFCs have been actively involved in securitization process, both working with adjustments to their lending practices often give least importance to the end users aka retail borrowers. With new MCLR regime, the interest rate changes implemented by RBI would immediately come into affect, but for an NBFC they are off hooks. They don’t do any transmission of interest rate changes. According the new rules prescribed by the RBI, the NBFCs need to consider the weighted average interest rates and the same has to be transmitted to the end borrowers. This though will not be having much of impact on NBFC, as their rates are of fixed type, while the banks rate are floating, they will be taking certain hit. In earlier cases the interest payments to banks were fixed at the start of deal and would remain same till end of maturity. This will benefit to end borrowers as part of their loan is linked to floating interest rate (MCLR for new loans) provided by bank. NBFCs Need to take more risk. 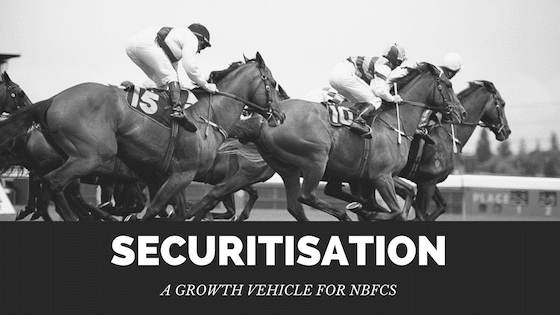 RBI guidelines stated that, NBFCs should have at least 10% of the risk on their books in case of securitisation. Rather than keeping it at same level for co-orginated loan, RBI has increased it to 20%. This ideally gives more buffer for banks and will be a relatively a safe play for them. From a NBFC point of view, they will have a significant exposure going forward, but if they can reign in the NPAs, then higher risk sharing is not going to stop them from securitising their loans. A reason why banks don’t expand into smaller ticket lending is the cost of reach. Securitization was easy, and protected their margins in case interest rates fell. This has led to lazy banking and overreliance on NBFCs. For NBFCs too, they were happy to charge higher and pass the risk of default to banks – so they only had to care about NPAs to a lesser extent. With a newer framework, NBFCs will need to bear a risk for a longer time and will therefore do better diligence. Lastly, the end-borrower benefits because if bank rates fall, they will see the advantage. They currently see only rates go up (NBFC PLRs are adjusted upwards) but not easily down as NBFCs don’t cut proactively. Securitization as a product will continue, along with co-origination. To make things attractive for coorigination, RBI might provide more benefits for such loans rather than securitized products. But, with the kind of return in securitization for NBFCs, we expect the product will continue. In the future, we believe India will securitize a lot more. Businesses like Club Mahindra already securitize their membership cash flows and sell it to banks. You might find telcos doing it for post paid customers, with higher loss protection. You will see a lot more of credit card receivables, fixed rate products (like car loans) and medium term lending. We don’t allow CDOs – to create pools of securized PTCs and then sell that further. (This was one of the pains in the credit crisis in 2008). Regulation is early and the market is early too but we believe it will be an interesting space to watch. Note: This post is purely an educative one; there’s nothing you could jump in to buy based on this post.